Well, the day has finally come for me to pull the trigger and make my announcement! 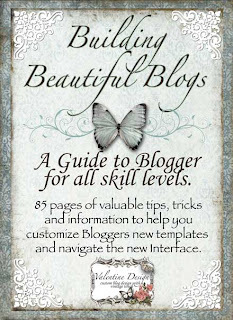 I am so excited to announce the release of my new e-book, Building Beautiful Blogs... A Beginnners Guide to Blogger! I've put all the information I can think of to help new bloggers (and even those who have been blogging for a while) navigate through Blogger with as little stress and frustration as possible! I get so much pleasure out of helping you all with your blogs, that I decided it might beneficial to put everything I've learned over the past couple of years in one place, so it's easy to read and follow. 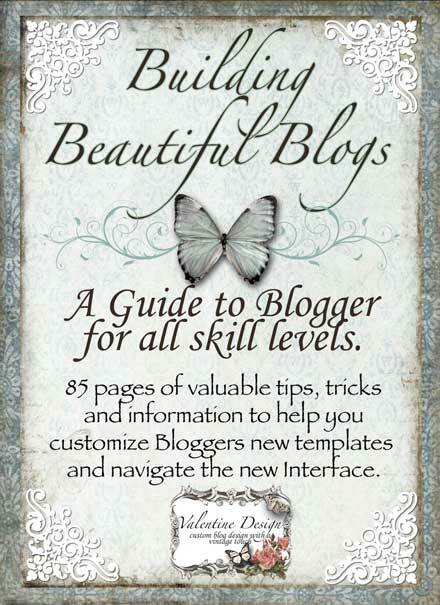 I remember being a new blogger and I would have loved to have had a resource like this when I started. I hope you will all go over to the new site and check it out. I am very proud of the finished product and feel very confident you will find lot's of great information to make your lives in Blogland less stressful, more creative and more fun!!! That is one book I will have to get! My very best wishes to you. Best wishes! I just ordered--can't wait! Thank you. Hi Karen, Congrats on your book... how exciting. I just ordered mine, I really need help sometimes, so I'm so glad that you have written a book for us!!! Congratulations Karen! Your book looks amazing. I wish you tons of success in your new venture! I just ordered your book before I saw this announcement because Kecia recommended it to me after I read her article about your book on her blog. This is wonderful Karen! Congratulations! I can hardly wait to see it! I will have to purchase this week as I need all the help I can get as I'm so busy stocking my store, I'm happy for an expert's help! I'm on my way to check it out, Karen. Yay for you! How Exciting for you Karen! I'm going to post about it on my blog,,with a Link! Congrats,,,I'm sure it will be well received! I wish it had been around 10 months ago! When i started I did not even know that if someone commented i was suppose to comment back...Oh so much to learn!! Congratulations Karen, I just ordered my book. I am always looking at new ideas and ways to improve things. I am so happy for you. Your Missouri Friend. I'm a sure this is just chock full of good stuff. I'm sure it will be a huge success! How wonderful, Karen! I'll be hopping over to check it out! Thanks for all you do and share, my friend! Congrats, Karen. Your book sounds fabulous. I'm so happy there are more resources like this available. When I started blogging a few years ago, it was so hard to find this kind of help. You are doing great work! I did it the hard way! I would have been so happy to have something like your e-book when I started last year. Congratulations! How exciting for you! I'm sure this will help so many! Oh wow...who doesn't need a book like this...well, maybe you:) Thanks so much for all your "tips of the trade"; I'm off to buy your e-book right now! Fantastic!! I will have to check this out....Thanks! You are right. This is a beautiful blog and fun to read. Congratulations Karen. I had my blog designed which I love, but I take it there will still be tips and info I can use just in every day blogging. Is that correct? I just popped in to say that I still love my blog that you designed for me. It's so much fun to open a blog and recognize your work, yet the personality of the blogger shines through beautifully. You are so awesome Karen! You have soo much knowledge, and to offer that to others is wonderful!! Oh I wish you MUCH success! I am sure the book will be a huge hit, it sure has helped us. Congratulations!! Congratulations on your new E-book! I've done a lot of online marketing for a number of years. However, one thing I've never been crystal clear on when it comes to blogs, is what the proper etiquette is regarding exchanging links with other blogs. I'm not sure if folks just add other blogs to their blog rolls and hope others will add theirs or if they ask bloggers if they would like to exchange blog links. Do you cover this in your book? Only you could do this and teach us so much! This is wonderful! When you come back from your trip - I am making this purchase! I think it is so cool that you are meeting up with a bunch of your blogging buddies. Hope you have a great time.